Along with other parts of the world, the Eid ul-Ftr festival was celebrated in different parts of Assam including Kokrajhar and Barpeta with religious fervour on Saturday. In Salakati of Kokrajhar district, Eid ul-Fitr was celebrated with prayers for unity, peace and brotherhood. During Eid namaz, prayer was also offered for the peace of the soul of All Bodoland Minority Students’ Union (ABMSU) leader Lafikul Islam, who was killed by miscreants. 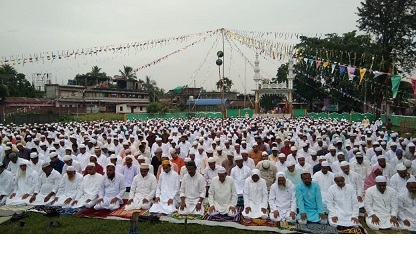 The Eid namaz, organized at the historic Eidgah in Salakati, was participated by thousands of people. After the Eid namaz, the followers of Islam wished and hugged each other on the occasion of Ei ul-Fitr. After the namaz, the Imam on behalf of all the faithful also sought blessings of Almighty Allah to protect them during floods and other natural disasters. Meanwhile, in Barpeta also, the followers of Islam celebrate Eid ul-Fitr with pomp and gaiety, and religious fervor. All the followers of Islam, after the month of Ramadan, when they remained in fasting during day time, prayed for brotherhood, unity and well-being of all during the Eid namaz. The Eid namaz began in the morning from 8.30 at Muslimpatti in Barpeta town. The Imam, who was present on the occasion and conducted the Eid namaz, was Rijwanul Haque of Uttar barpeta Jame Masjid. The Eid namaz was participated by a large number of people from small children to the aged who prayed to Almighty Allah for peace & tranquility and brotherhood.